This is a picture of Pepper the tabby cat. Editor's note: Thanks Chelle for submitting this pic. 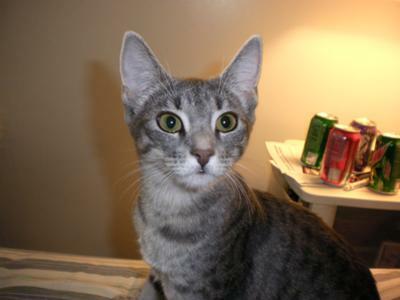 It looks like possibly there's a bit of Egyptian Mau in this kitty? It's difficult to tell the eye color (to qualify to be show cats, mature pedigreed Mau's must have green eyes) but I believe the patterning may be spotted similar to the Mau. I could be wrong. Some Mau's are more clearly spotted than others, and some tabby patterns can look like spots but really aren't. For example, the mackerel tabby pattern (the most common of tabby cats) may be broken up into spots or bars. I also notice that Pepper has fairly large, fairly wide set ears, which is characteristic. Just for fun, I've included a video of some kittens below to compare. Does this cat look "Mau-like" to anyone else? Or am I way off?